The Organization of Petroleum Exporting Countries (OPEC) has injected considerable volatility into the energy market since many of its members declared that they would voluntarily restrict production in an attempt to rebalance the global market, and along the way, raise crude prices. The global price of crude has implications for U.S. natural gas production and prices, but the relationship is not well understood. While natural gas prices exert little impact on the global price of crude, the global price of crude has a significant impact on natural gas production, thus the U.S. natural gas price. Depressed crude prices have contributed significantly to a leveling, and more recently, a decline in U.S. natural gas production. That decline now threatens to become a supply shortage that will lead to a sharp rise in natural gas prices over the next six months to a year. Ironically, OPEC’s success, while raising oil prices, may place a cap on rising natural gas prices, or possibly even drive them lower. This article explores this dynamic. The total revenue that a producer receives and that drives return on investment, is a function of the price of each contributing commodity. Decisions to drill are predicated on expected revenues from the combination of commodities that the producer projects it will get from each well. In areas such as the Karnes trough in the Eagle Ford basin, crude volumes are so large relative to the comingled gas volumes that the price of gas is largely irrelevant to the decision to invest capital in the well; rather, it is the price of crude that drives revenues and drilling activity. In other places such as the Anadarko basin, crude production is a lower portion of overall revenues from the well, so the natural gas and/or natural gas liquid (NGL) production makes a material difference to the overall return of the well. In these areas, the combination of oil and gas prices are relevant to the investment decision, as depicted in Figure 1. Source: DI ProdCast. Charts show the sensitivity of different basin/fields to WTI and Henry Hub prices. Every point on the line corresponds to a WTI & Henry Hub price combination that provides a 20% minimum acceptable rate of return. In Figure 1, the lines represent the combination of oil and gas prices that provide a 20% minimum acceptable rate of return from the top tercile of wells in various fields within the Permian and Anadarko basins. A steeper slope indicates greater sensitivity to gas prices, as gas comprises a larger proportion of the production stream. Therefore, the figure illustrates that Permian basin wells are less sensitive to gas prices than Anadarko basin wells are, because the relative proportion of gas supply is small relative to oil. However, because of comingled oil and gas production, it is critical to forecast the combined production stream – oil and gas – at various price combinations in order to accurately depict the economics of supply. In our example above, without understanding the gas oil relationship an analyst would be likely to underestimate gas production levels if either commodity price changes. The significant of this point is illustrated by reviewing historical gas production from the past eight years. During the early phase of the shale revolution, drilling activity focused on natural gas wells. It triggered dramatic increases in gas production, from 48 Bcf/day to 62 Bcf/day from January 2007 to December 2011, a 28% increase over the period. Not surprisingly, the increase in production resulted in a decline in gas prices to below $2.00/MMBtu. The significant of this point is illustrated by reviewing historical gas production from the past eight years. During the early phase of the shale revolution, drilling activity focused on natural gas wells. It triggered dramatic increases in gas production, from 48 Bcf/day to 62 Bcf/day from January 2007 to December 2011, a 28% increase over the period. Not surprisingly, the increase in production resulted in a decline in gas prices to below $2.00/MMBtu. What was surprising, however, was that despite low gas prices, gas production subsequently increased to a peak of 73.5 Bcf/day in February 2016, as shown in Figure 2 below. Sources: DI ProdCast for gas production, EIA for prices. DUC well: At Drillinginfo, we begin our analysis with the literal definition: a well that has been drilled and has not yet been completed. As of June 23, we had approximately 6,100 DUC wells in the 14 states where we track DUC wells, excluding new wells drilled in the month of June, as shown in Figure 1. The chart shows the DUC well count based on the month when the well was drilled, and the high number of American DUCs in recent months indicate normal inventory in the process of being completed. While the total DUC count is useful to track activity levels and forecast potential production, examining DUCS by vintage refines the DUC count into relevant subsets. Let’s use the Eagle Ford as an example, where we have 586 total DUCs as of June 23, as shown in Figure 2. Similar to Figure 1, this chart shows higher level of DUC wells in more recent months, reflecting what we’ll refer to as work-in-process inventory (WIP). This is the portion of DUC wells in the normal lag time where the drilling has finished but completion activity hasn’t yet begun, or where a completion might have been finished but the associated filings have not yet been published nor has production been reported. This “time lag” varies by state based on different regulatory requirements, but simply scanning the chart indicates a step-change in DUCs from December 2015 to present. If we make a general assumption that wells drilled in the last six months are part of WIP inventory, we have approximately 248 wells in the Eagle Ford that we would expect to move from drilled to completed status on a normal schedule, as illustrated in Figure 3. The chart shows the number of wells in the month they were drilled and the county where they are located. Not surprisingly, the most active counties for recent drilling are Karnes (green) and Dewitt (dark pink) in the core of the play. Deferred completions: Many times when people ask about the DUC count, they really want to know the number of “deferred completions”, where drilling finished more than six months ago, and we still have no evidence of any completion or production activity. This may occur because a company is waiting for pipeline infrastructure or capacity, or because of an intentional delay waiting for better oil or gas prices. When I compute deferred completions, I typically begin counting DUCs from approximately October 2014, where there was an increase in DUCs coinciding with a significant decline in oil price, up to the WIP inventory period. Continuing with our example, we have 296 deferred completions in the Eagle Ford during October 2014 through November 2015 as shown in Figure 4. When and if these will come online will depend primarily on oil prices, and we can map them to see locations relative to the core, estimate future production based on offset wells, and perform a single well economics to determine when completing these may be economic. What about DUC wells drilled prior to October 2014? This may be included in deferred completions, but I often refer to these as “dead DUCs.” If wells were not completed when oil was $90-$100, there is a good chance these will never be completed. We have 42 in the Eagle Ford during the period March 2014 through September 2014, as shown in Figure 5. Classifying the 586 total Eagle Ford DUCs into work-in-process (248 wells), deferred completions (296 wells) and dead DUCs (42 wells) isolates relevant portions of the DUC inventory to enable comparative analyses and start to evaluate changes in these counts over time. For example, two weeks ago, there were 315 deferred completion DUCs, so operators have completed 19 of those wells. Our approach utilizes rig tracking to identify wells drilled, and then queries permit types, completion records filed at the state agencies, Frac Focus records, and well status filings to identify DUCs. We have a whitepaper available upon request that further details the methodology. These wells were finished drilling in October, before prices fell, but the product would not be brought online until November or later, at the lower oil price. Oilfield operators have many decisions to make about how to drill and complete their wells: how long of a lateral, how many perforation stages, what is optimal spacing, what type of proppant to use, how much fluid, etc. These decisions can be influenced by whether an operator seeks to maximize the total production over the life of the well, or to maximize internal rate of return. Creaming curves summarize the results of many decisions on drilling and completing a well by graphically displaying an operator’s production performance over time. These graphs allow a user to quickly identify whether an operator is performing better or worse than its peers, to isolate changes in completion techniques, follow an operator’s learning curve in developing a play, and predict when an operator has exhausted its best acreage and production will start to plateau. 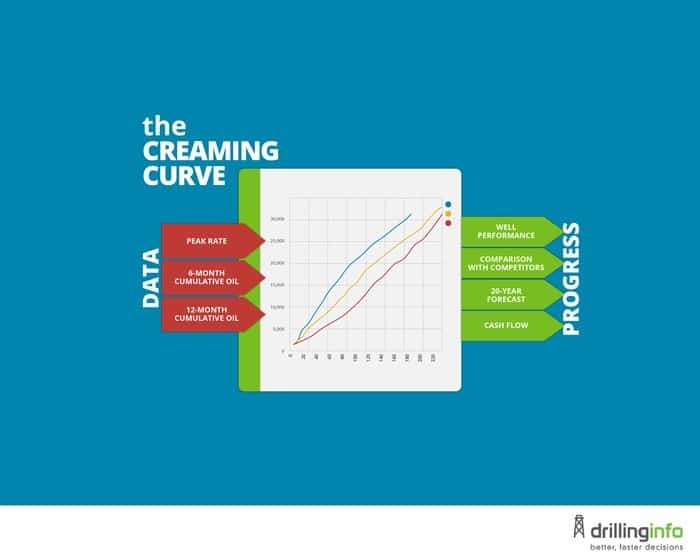 Drillinginfo creaming curves measure incremental production from wells in the order in which they are drilled. Various production metrics can be used: peak rate, six month cumulative oil, twelve month cumulative oil, etc. Figure 1 is a creaming curve for three operators in the Eagle Ford. It shows cumulative peak month oil production for wells drilled from January 2009 to January 2015. Using Drillinginfo proprietary Graded Acreage, we can compare operators normalized for reservoir quality (Drillinginfo Geology and Analytics teams grade reservoir quality to a single square mile resolution and categorize into Grades A through J, where A is the highest quality); all of these wells were drilled in Grade A acreage, the sweet spot of the play, so differences in production should be a result of engineering practices, not geology. If a creaming curve has a 45 degree trajectory, each new well produces the same peak month production as the previous well did. A steeper trajectory indicates new wells are adding increasingly greater peak month production. In Figure 1 above, Operator C (dark blue line) started out performing worse than the other operators and then improved techniques to outperform peak month production compared to Operators A and B.
Inflection points that change the trajectory are of interest, as they indicate changes in operational techniques. If we review completion reports for wells 50 and 120 of Operator C, which appear before and after climbing the operational “learning curve,” we will expect to see different completion techniques. Which operator is performing the best? Because peak rates are highly correlated with total production, Figure 1 is a compelling graphic to conclude that Operator C is performing the best of the three operators. However, peak month production does not tell the complete story. Figure 2 is a creaming curve for the same three operators in Grade A acreage showing well performance after 12 months. Now we see that Operator B is outperforming its peers at the twelve month mark in terms of total production, and when we did this again for 24 month production, the comparison showed Operator C falling even further behind its peers. The creaming curves illustrate a trade-off between maximizing high initial production versus maximizing total production over the life of the well. Obviously higher peak rates shorten the payback period of an investment, but do they also result in higher net present values? We can model decline curves and compute cash flows to determine the relative financial results. For our models, we select wells drilled in 2013 by each operator in high grade acreage to have sufficient production to forecast declines. Using DI Analytics, we estimate decline curves, forecast production for twenty years, and build cash flow models for a single well from each operator. We hold economic inputs constant for each operator, assuming $55 oil price, $3 gas, $7 million well cost, 10% discount rate, and the same tax rates and royalty interests. The net present value (NPV) and internal rate of return (IRR) for a single 2013 well for each operator are shown in Figure 3. Operator B achieves the greatest NPV of approximately $2.3 million, and Operators A and C have NPVs of $1.23 million and $990K, respectively. Operator B, A and C earn 39%, 25% and 19% IRRs, respectively. However, Figure 4 depicts how the sensitivity to oil price differs depending on the production profile: high peak rates with more rapid declines make sense when oil prices are higher. As oil prices rise, Operator C increases its IRR at a faster rate than the other two operators do. Given that oil averaged approximately $100 per barrel in 2013, Operator C’s strategy appears to be a good choice. Creaming curves are a quick way to understand how an operator is producing its wells versus another operator. However, the “right” strategy to pursue may depend on the price environment. While wells with very high peak rates pay back investment quicker, is this the optimal approach in a low oil price environment? Many of the wells included in the creaming curves above were drilled in a $100 oil environment, and perhaps we will see a change in production profiles as more wells are drilled and completed in a $50 oil environment.